SPRINGDALE — Springdale officials are dealing with quite a headache after freshly poured concrete throughout the town was ruined by foot and bicycle traffic, despite the fact that the newly minted sidewalks were covered and taped off. “Some of the concrete that was put in was still wet and people have ridden their bicycles through or have walked on it, which leaves permanent prints,” Springdale Mayor Stan Smith said. “Now Sunroc has to come back through and tear that up and redo the sidewalks to get rid of the prints,” Smith said. 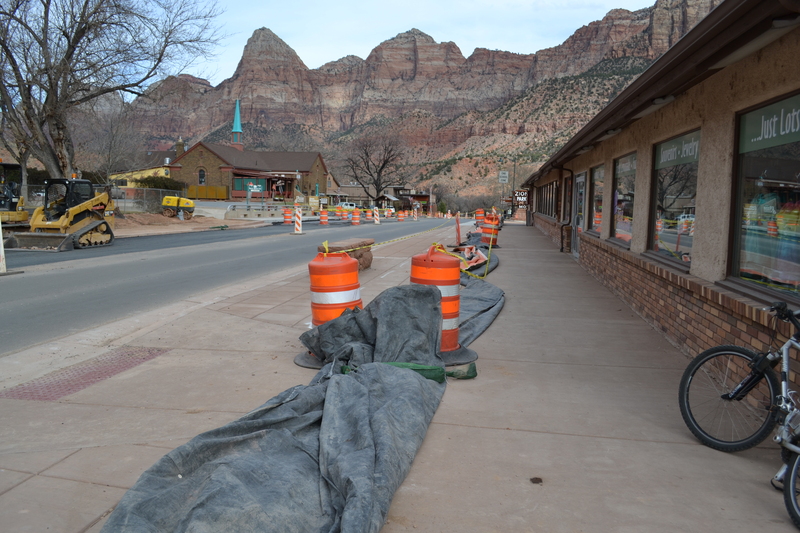 The sections of sidewalk requiring a redo run along state Route 9, which is currently under reconstruction by the Utah Department of Transportation. On some portions of sidewalk, deep imprints are visible in the now-hardened concrete. In some cases, the concrete was only poured days ago. Replacing the ruined sections of sidewalk will be costly and delay the road project, according to a news release issued by Springdale Friday. “It’s a big cost that’s incurred,” Smith said. Poured concrete can take several days to cure, depending on the temperature, and may remain soft despite appearance. New concrete will be put in place in the coming weeks. According to the news release, those who disregard sidewalk closures may be responsible for the costs to correct the damage. 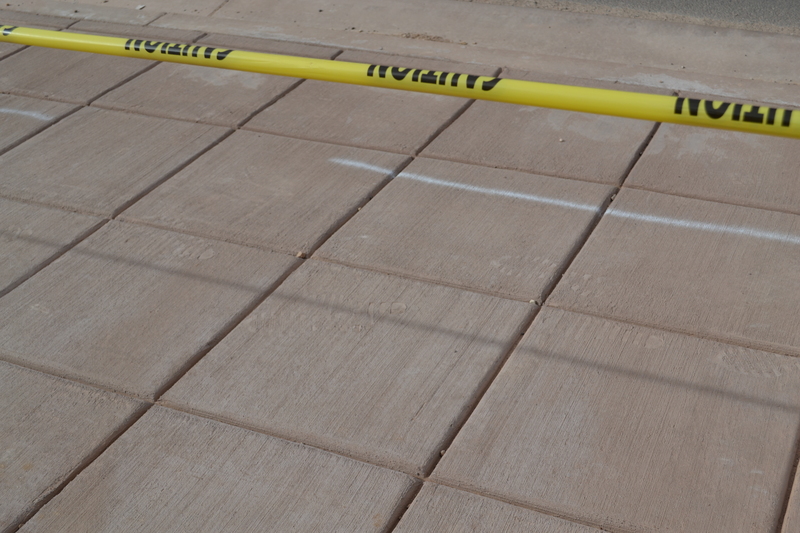 The town is asking anyone who witnesses someone vandalize the sidewalks or any other street work to contact the Springdale Department of Public Safety at telephone 435-634-5730. Hey mayor smith, don’t you own that building where the tracks are?! Yes you do. Abundant ignorance. Lack of civility. Not my generation. This would almost be funny except it’s our tax dollars paying for all this. It’s actually really messed up. A lot of these tourists are either not real bright or have no respect. Could have been a few locals as well. Gonna have to hire “guards” to keep them off the sidewalks or bring in a bunch of chainlink fence and set it up w/ absolutely no gaps. Leave it! The Park has sidewalks walked on before dry. Doesn’t hurt a thing. You can barely see these. What egos to have it removed and ‘pristine’. I notice the sidewalk is larger, wider. Where are the cars going to park now? I hope they will not rely on businesses like the old Pioneer Restaurant to provide any kind of parking. It was a mess before, wonder what it will be like now. maybe they felt like sunroc needed the extra busine$$. It is tax money. There’s plenty more where that came from. Milk that cow dry I guess. Well there it is. another conspiracy by Prophet Bob ! In a way it does add “character” to the sidewalks. Around my block we’ve got little “engravings” of so-and-so loves so-and-so from like 1996, plus footprints. It’s silly but it doesn’t seem to harm anything. Aww, I’m miles from there. Woulda been funny tho. I’m not sure the date is ’96 exactly. Haven’t walked by it to take notice in quite a while. Springdale is building a large multi-level concrete parking structure as part of improvements to the town. They are also installing parking meters for street parking, as well as paid parking lots. Please just finish the construction already!!! It is a nightmare to try to drive through!!!!!!!!!!!!!!!!! I agree…it’s not that bad. Why redo it? prob because it isn’t their money they’re spending? Maybe some clown working for sunroc is directing the tourists to walk on the wet cement. That way they can redo it 3-4 times $$$$$$$$$$$. I’m not quite that cynical yet, but I wouldn’t be shocked at all.